For many years now (we won’t discuss how many, thank you very much), I have loved watching the Summer Games when they air every 4 years. When I was young, I would sit and watch the swimmers and the gymnasts with my mom, telling her that someday I totally WOULD be doing that. While it made for great family time with my mom (something I have continued with my kids), it didn’t quite turn out how I had hoped. When it came to being a gymnast, I was too tall by the time I was ten. There are no 5’8” gymnasts. As for swimming, I can honestly say that if they ever create a category called “Floating In The Pool While Dozing And Getting Sunburned”, I’m the gal who will win the gold. Until then, not so much. The athletes at both the Summer and Winter Games amaze me. The total dedication to their sport, the passion to succeed. I can be that passionate over a pint of ice cream, but to work as hard as they do to be the best? Again; they amaze me and have my undying admiration, especially these tiny little girl gymnasts who are so strong, so creative and so wonderful at what they do. I could never be one of the judges. I’d want to give everyone gold, then feed them all cookies and milk and tuck them in for a good nights sleep. The thing is, we all live our lives the best we can, and while this may not be as exciting as competing in the games in Rio this year, it can be so medal worthy regardless. Admittedly, some days, you’re lucky to get a bronze, but life is about so much more than the gold, don’t you agree? For me, it’s finding my favorite flavor of ice cream on sale, it’s getting to the satisfying ending of a book I’ve loved and knowing that everyone lived more or less happily ever after, it’s time spent with family, enjoying the Summer games together and listening to my youngest son tell me that someday he will be a gymnast (he is already too tall. I’ll let him figure it out for himself) or a swimmer (we just got him out of the safety vest. Let’s NOT scare the momma), it’s listening to the wind rustle through the trees as I lie in the pool dozing, it’s creating a recipe that I know my family loves. Those are MY moments of gold and I’m honored to have been able to share them with you. What are yours? Meijer asked me to create a recipe for their More Than A Medal campaign. I knew I wanted to create a recipe that I thought any athlete of the games in Rio or aspiring athlete would love and also could eat with no guilt. I have to admit, this salad fits both criteria. It’s completely delicious. The chicken is moist and tender with a crispy outside and a tiny bite from the pepper. 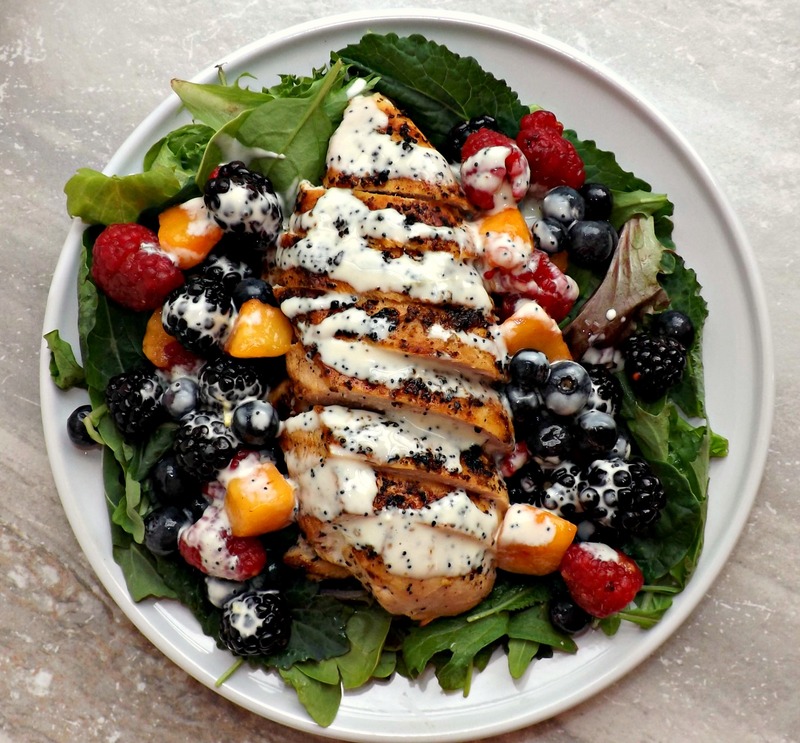 Mix that with the juicy berries and peaches, the crunchy greens and the creamy lemon poppyseed dressing and you have a definite gold medal winner here. All with no guilt. This is a perfect Summer entree for two that is easily doubled or more to feed extra hungry mouths. I hope you all love it as much as we did!! Make your dressing- In a small bowl, combine all the dressing ingredients. Whisk well to combine. Taste for seasoning. When ready, pour into a covered container (a mason jar works wonderfully) and store in the refrigerator for at least an hour to combine the flavors. 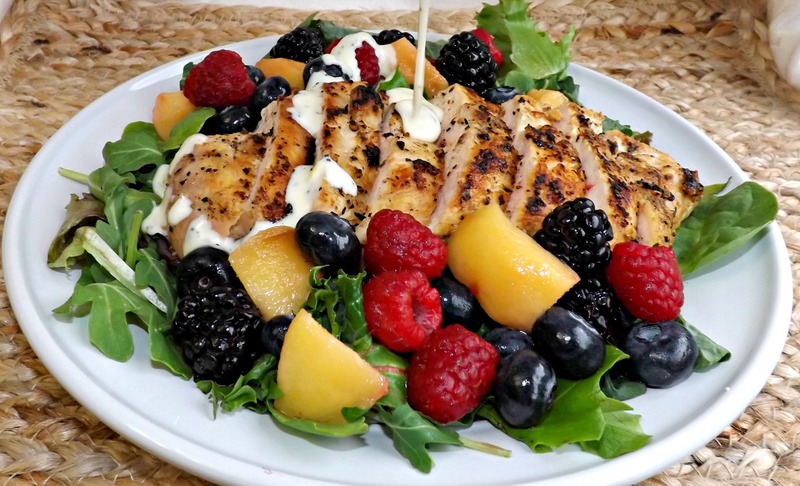 About half an hour before you start the chicken, you need to get the berries ready. These couldn’t be easier. In a small bowl, combine the white balsamic vinegar and the sugar and honey and give it a quick whisk. Spoon the berries and peach chunks in with the vinegar mixture and toss gently to coat the fruit. Set it in the fridge until you make the salad, making sure to give it a good stir just before you add it to the salad. When ready to grill, preheat your grill to medium high if using an electric or propane grill. This can also be done easily inside using a grill pan. Pat the chicken breast dry. Coat with the vegetable oil on both sides. Sprinkle half the seasonings on one side of the breast and press it gently into the surface of the meat. Repeat on the other side. When the grill and the chicken are ready, place the chicken in the pan (or on the grill) and cook on one side until golden brown. Flip carefully to the other side using tongs and continue to cook, turning as needed, until the internal temp of the chicken breast is 165°f. Remove the chicken to a plate and let rest for about 5 minutes. While it rests, divide your salad greens between two plates. Slice your chicken breast on the bias and place half on each plate. Give your fruit a stir and divide it between the two plates. 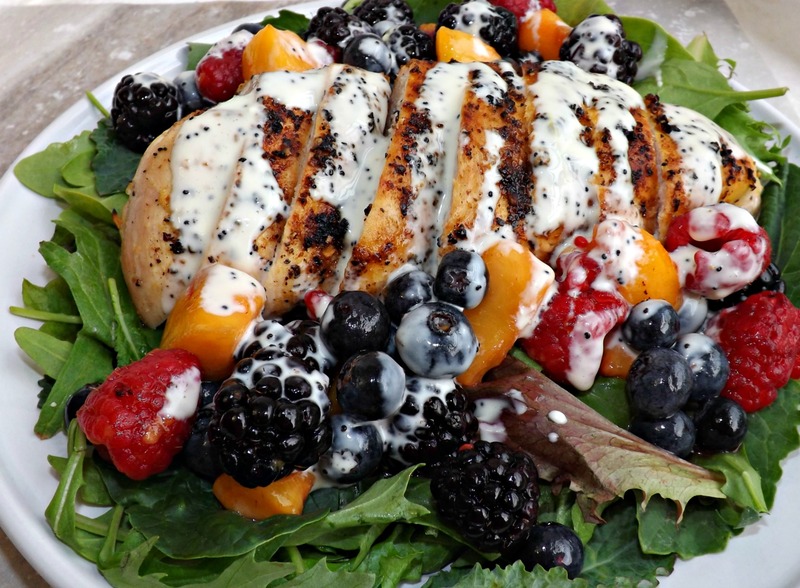 Whisk the lemon poppyseed dressing one last time and drizzle it over the greens, chicken and fruit. Serve. Disclosure- I was compensated by Meijer for this post. All contents within are original and developed by myself. I was talking with a blogging friend of mine yesterday, comparing future posts. 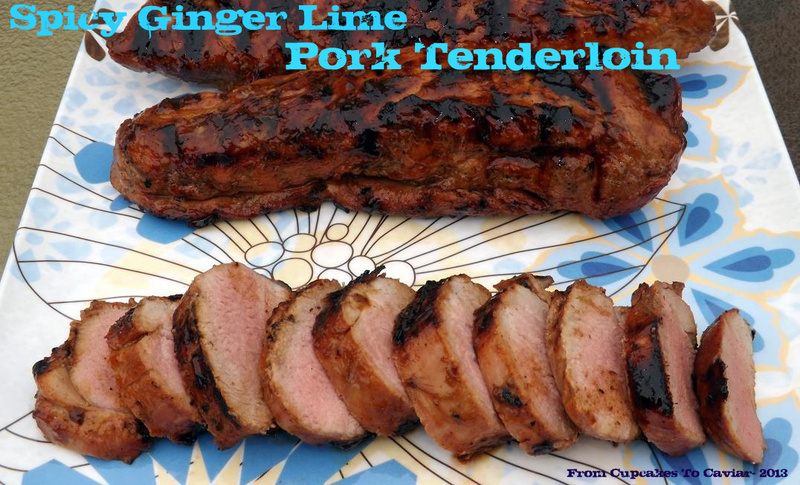 When I mentioned I would be using this recipe I came up with for a grilled pork tenderloin, her response to me was “is there anything you can’t cook?”. Being a woman with the brain cells of an eggplant, I wasn’t sure what she meant and asked. Her response (Beyond “Duh Janet”) was that I ran what I called a baking blog but I didn’t do just baking posts and certainly didn’t seem to be a food blogger who knew how to cook one type of food and that was it. My response? That yes, there were things I can’t cook. I make a truly atrocious dish of boxed mac and cheese. I am utterly incapable of following the directions on the box and always end up with either a soupy or a gritty mess. Though how one makes something with a gritty powder into something that ISN’T a mess is beyond me anyway :-P. My husband, who can’t cook a lick, manages fine however. Go figure. I also am horrid at decorating layer cakes. I can make a homemade cake with the best of ’em but when it comes to decorating/frosting it, I am fairly sure that my 4 year old son could do better. I also reminded her that I have six kids (though admittedly, three are grown and married) and that at one point in my life, I was cooking for 5 kids, three of them teens and a husband. When doing that, you learn to make a variety of things sheerly out of self defense. I was scared that if I didn’t have a constant supply of food ready, they would turn on me and I would wake one night to find my legs being salted and peppered, and two teen boys and a girl along with two little boys standing over me with napkins around their necks. So I cook. Many different things. Not just baking, though that is the favored thing in a house that still has two teen boys (the ones who were little in the above mentioning), a 4 year old and a husband. Not to mention, at the moment, 2 stepkids, my daughter and three of my grandkids. yeah, baking is a definite favorite. I had been trying to figure out for a few days what I wanted to do with this pork loin and I finally got fed up waiting for an idea to pop into my head and just went to the cabinets and fridge and starting pulling things out. I tend to do some of my best cooking that way actually; when I stop trying to do things by a recipe and just…cook. This spicy, but not too much so, a little bit sweet, tangy and with the perfect balance of saltiness. All in all, just yummy. And you can’t get much easier than combine some ingredients, put the meat in them, marinate and cook. In a large bowl or 2 gallon ziploc bag, combine all ingredients other than the pork. Stir well to combine or if in the bag, close the bag and squeeze it to mix ingredients. 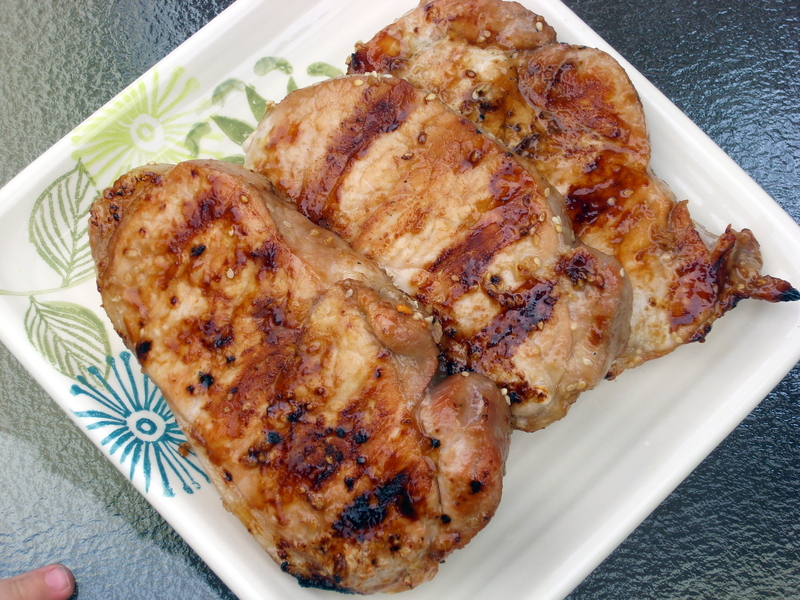 Take out one cup to use as a basting sauce then add the pork to the remainder of the marinade. Marinate in the fridge (I suggest setting the bag into a bowl to be safe in case the bag leaks) for at least 2 hours and up to overnight. When ready to cook, preheat grill to medium hot. Your coals should be totally covered in gray and you shouldn’t be able to hold your hand close to them for more than three or four seconds before you have to pull away. Oil your grill grate by brushing it with a bbq brush that has been dipped in oil. Place the pork directly over the hot area. Cook the pork until an instant read thermometer inserted in the thickest part of one of the loins registers about 145 degrees. Turn a few times during cooking, basting each time with the reserved marinade. Transfer to a platter, cover with foil and let rest for ten minutes before slicing. If you want to serve this with what sauce is left, make sure you bring the remaining sauce to a boil first to prevent cross contamination. Looks like a pretty plain burger, ehh? Well, don’t be deceived! That plain look isn’t the fault of the burger, just me as the one who photographed it hehe. Over a week ago, I made these for the first time. We absolutely loved the burger, but I absolutely hated the photos I took of it. So I asked on my Facebook page if the wonderful people who have my page liked trusted me enough to have me post the recipe even though the photos stunk. The answer was an overwhelming yes, that they trusted me enough even if the photos were bad. I was actually kind of touched to be honest.. But…. I just couldn’t do it. I mean, the photos really really stunk. So, I made the burgers again. Nobody minded hehe. They are truly yummy. And I tried the pictures again. Guess what? They sucked too. I am not capable of taking a good burger photo, it seems. I’m posting it anyway because these burgers deserve to be seen… to be eaten… quite possibly to be revered and worshiped on the alter of burgerness. Or something. Sorry. I had a moment there. Seriously though, these are really really good. Add a few more reallys in there for good measure. Then git to cookin’. You want these. You really do. Don’t let the photo fool you. These are meaty, flavorful, tangy from the onions, a bit of a salty kick from the feta and creaminess from the cheese on top. You could dress these with tomatoes, ketchup, etc etc but they really don’t need anything. The meat is flavorful enough on its own and the onions just put it over the top. Also, I did these in a grill pan indoors but feel free to grill them on the bbq. Get your burgers put together first because they will need to chill- In a large bowl, combine all the burger ingredients except the lamb and feta. Mix well. Put the lamb and feta on top and using your hands, lightly mix everything together. 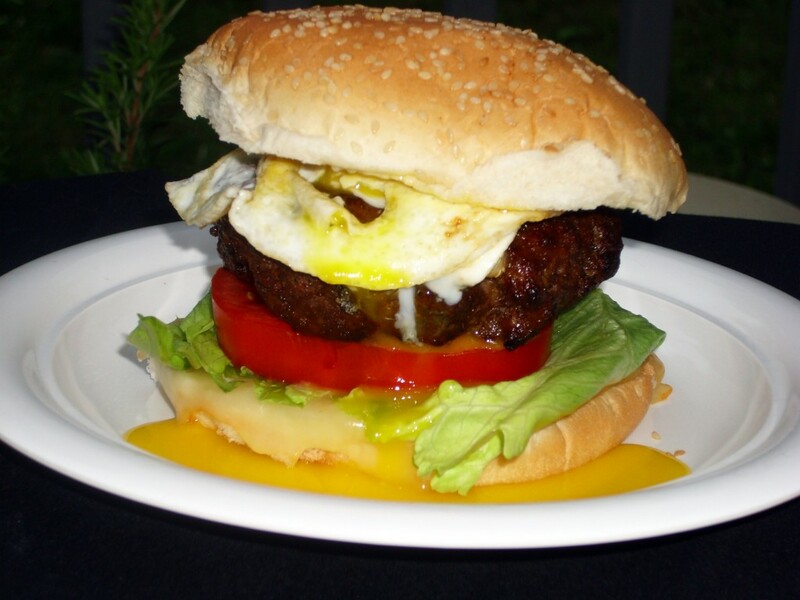 Don’t overwork the meat or you’ll have tough burgers in the end (and smushed cheese). Shape the meat into 6 patties. Again, don’t overwork it but make sure they are firmly together. Put on a plate, cover and chill while you make the onions. 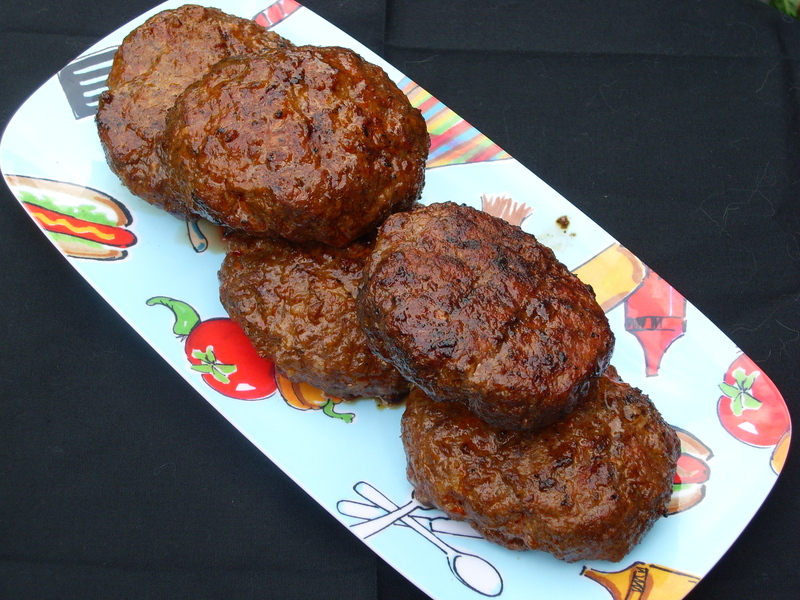 These are fairly soft burgers due to the dressing in them so they need to chill some to firm up. Do NOT skip that or you’ll end up with a crumbled mess when you try to cook them. While the burgers chill, make your onions- in a large pan, heat your oil and butter. Add in the thinly sliced onions and turn the heat to low and cover the pan. Let the onions cook over low heat until they are totally soft and transparent. Turn the heat up to barely medium and uncover the pan. Stirring frequently, cook the onions until they are a deep golden brown. Don’t rush this by turning up the heat. The process will take at least 25 minutes or so, probably longer. When they are nicely browned, pour in the balsamic vinegar and the brown sugar. Stir well to combine. Turn the heat back down to low and cook the onion mix, stirring frequently, until about 3/4’s of the vinegar is evaporated. For the burgers- Heat a good frying pan, preferably a cast iron grill pan, over medium high heat until it is almost smoking hot. Do NOT attempt this if all you have is a non stick pan. They can release toxic fumes if heated too high. If that’s all you have, just heat the pan for a minute over medium heat. To serve, simply put a burger on a bun, top with a scoop of the onions and some cheese. Eat. Love me forever. Set up a burger alter. Cry because I am incapable of taking burger photos that do this justice. I’ve mentioned before that I have a crappy appetite. It’s hard for me to find foods that I really like but when I do I rarely venture far from them *Cough Twinkies and Cheetos Cough* (and yes, they ARE foods. Kind of.) Like a medium rare ribeye, potato wedges and roasted brussel sprouts will always, always always be my all time favorite dinner. Nothing, not even Ben & Jerry’s Phish Food will replace it. You may have noticed that I have not been posting as much of my normal “OMG, if I eat this my arteries will harden and fall out of my body” type of recipes. That has been a symptom of the above issue. No, I’m not pregnant before anyone guesses that lol. But there HAS been something going on. If you “like” my facebook page, you may have seen an update here and there about exercise and calories (frightening from me I know, but you can take the mental blow. I have faith in you.). Well, about 7 or so weeks ago, I began a pretty frightening undertaking. And part of that included much less of those delicious artery hardening foods. You see, I finally got fed up with my weight. And as of today, I am now 30 pounds lighter than I was about 7 weeks ago with about another 30 to go. It hasn’t been easy because I stopped making (to avoid eating them) all the baked goods I love. Thus why all of you haven’t been getting posts filled with those foods. *Sobs in abject shame* I’M SORRY!!! I’ll try to post more of them!! Seriously, I will. I am now able to have some faith in my own abilities to stay away from the foods I need to avoid. I also have enough faith now, since I have been doing this for almost 2 months and am 30 pounds lighter, to know that when I DO make the fattening foods, that I can eat a piece and not feel like a failure. It’s hard to explain the way my mind works and the mindset I had. With me, I have always been all or nothing. If I wanted to lose weight and ate something bad for me, that’s it… I was a total failure and I gave up. Not this time though. I have my cheat days (today is one) and I eat what I want then I get back on the proverbial diet bandwagon. And please don’t tell me to not call it a diet but a “lifestyle change”. I’m not that modern lol. It’s a diet. I’m fine with that. It’s just a word used to describe the changes I’ve made. So today, for said cheat day, I made something that can be either quite good for you or somewhat not, depending on what you do to it before eating it. I absolutely love Greek food and one of the things I get at the fair every Summer is a Gyro. But a good Gyro, made with beef and/or lamb, is hard to do right in a home setting. I don’t like the ground meat ones so there’s where that all or nothing mentality came in. I couldn’t have a huge chunk of meat turning on a spit in my kitchen and one of those cool knives they use to cut the meat, I wasn’t going the beef/lamb route. So I used chicken. So c’mon. Get to cooking. Your family will love you and quite possibly erect a statue in your honor. Just make sure they wash their hands first. That sauce drips everywhere. Don’t be put off by the long ingredient list. Most of it is for either the marinade or the Tzatziki, both of which go together very quickly. Combine all the marinade ingredients in a large non metal bowl. Stir well to combine. Add in the chicken thighs and stir well to coat. Cover the bowl with plastic wrap and refrigerate for at least 4 hours and up to overnight. Meanwhile, while chicken marinates, make your Tzatziki. Combine the yogurt and sour cream. Add in the lemon juice, garlic, dill salt and pepper. Stir. Gently fold in the grated cucumber, then the olive oil. Cover and refrigerate for at least 2 hours and up to 4. If marinating the chicken overnight, wait until about 2 to 3 hours before serving to make the sauce. Heat charcoal grill to a medium high heat. If using gas grill, I’m not an expert there but I would guess medium high there too. 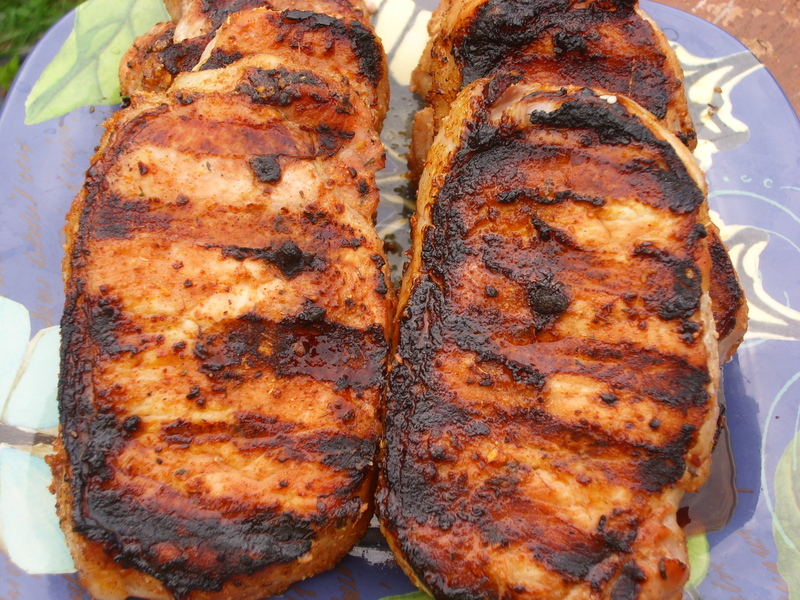 Remove chicken from marinade and grill over medium high heat (this could easily be done on an indoor grill pan too) until the chicken has reached an internal temp of about 155, about 4 minutes on each side. 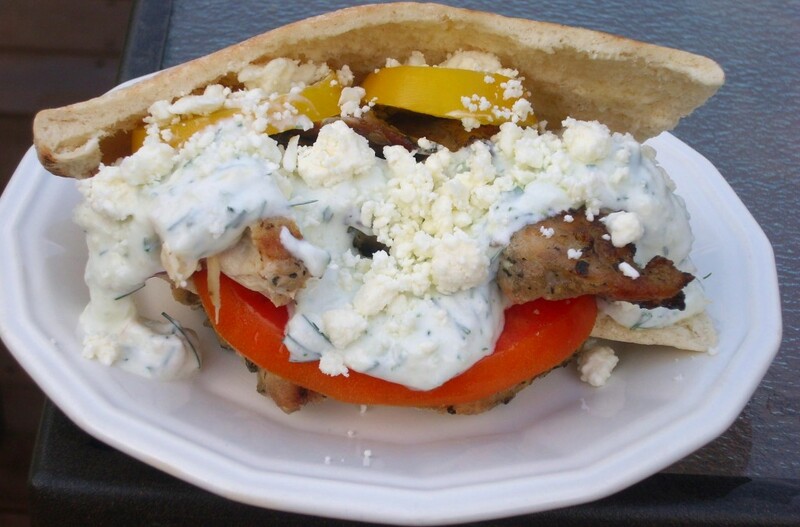 Let the chicken rest for about ten minutes, then serve in/with pita bread, onions and tomatoes and Tzatziki. Sprinkle feta on it. Eat, drip sauce. Enjoy. Write me fan mail. This little piggie went into my tummy. When I was a kid, my imagination was just as active as it is now. And no, my parents never put me into much needed therapy hehe. But when I would hear that old rhyme, I always imagined piggies, dressed in cute knee length dresses, pushing a shopping cart through Jewel with little piggie kids being freely allowed to throw packs of Twinkies and ice cream into the cart. Because piggie parents are cool like that. I also always felt sorry for the little pig that stayed home. WHY did he stay home? Was he in trouble? Too busy reading Charlottes Web? Eating roast beef? As to that, do pigs eat roast beef? My mind would envision him with plate, napkin around the neck and snout buried deep into his food. Oink. Oink I say. Oink. I have mentioned before that we love pork in our household. I’ve mentioned it more than once actually. because…well… we love pork. Or at least, I love pork and my family is forced to follow along in my cloven footprints because of it. I have posted quite a few porky recipes in here (especially when one considers that I am primarily a baking blog… pork cookies anyone? A nice baked pork and rice pudding perchance?) with one of my personal favorites being My ode to Anthony Bourdain . I’m still waiting for him to leave his wife and come find me and take us all (my husband and kids have to come too…) away to live in fatty pork sin. But only because I have a thing for talking in fake accents and that’s my very bad take on a Brooklyn one. I think I mentioned before that I have a weird quirk and love talking in different accents. Luckily for me, my husband shares my quirk and hasn’t attempted to get me into therapy yet (well, not for THAT anyway) and if he did try, he would probably do it in a Russian accent so I’m not sure the therapist would take him seriously. We are a sight to behold…or would that be behear? when we walk through the grocery store talking loudly to each other in either a Russian, Indian or Scottich accent (our favorites). We get some interesting looks. I’m still waiting for someone to ask us where we are from because I just know I wouldn’t get through the answer without cracking up. Is it possible to laugh in a Russian accent? Hmmm. But when we do this, he is Boris and I am Natasha and we use the names out loud but so far no one has caught on to the background of the names. Did nobody else watch Rocky and Bullwinkle when they were kids? That or they are scared to approach the crazy couple perusing the peanut butter. Clean up in aisle nutso! With those two (and an American Southern accent and an upper crust British accent) I can voice them with no help. But strangely, with other accents, I have to have visual or oral help such as reading a book that portrays a character speaking with an accent or hearing it. Yes, I am just weird enough that I have a method for speaking in fake accents. Hey! We all need a hobby right? Mine is …is…is… ok, so mine is just generally being strange but that’s a hobby too! Not everyone can knit! Where is this all leading you ask? Well, hell if I know! You’re expecting logic and a nice path to a recipe here? You soooo must be new to my blog. 😀 My blog is all about nonsense and trying to get a laugh any way I can. Wait. That doesn’t make me sound very good does it? My blog is a place for logical stories and essays, linear thought processes and recipes that are the envy of five star restaurants and yes, I’m looking into that therapy now. Today I’m posting (please to be imagining all of theese in a a Russian accent.) a recipe I came up with for a nice spicy (yes, more spice. If you don’t like spice you may need to check out www.blandfood.com. Now I am going to have to check to see if there is a web site with that name. I’d be willing to bet there is lol) southwestern style burger. I thought about making a mayo or relish to go with this and may do that in future incarnations but this time I wanted the burger to be the centerpiece, not the toppings. So I just used the typical ones to add crunch and cheesy goodness. 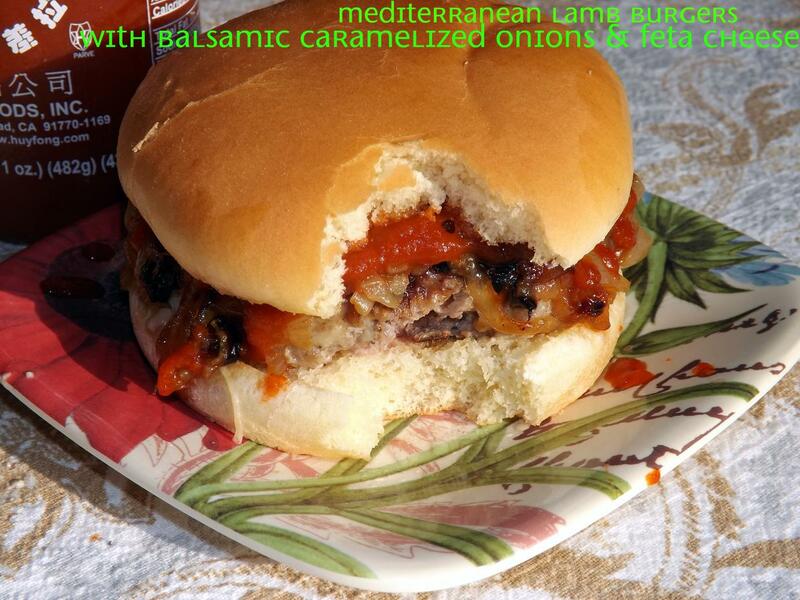 This is very quickly put together and very flavorful and you can vary the toppings. Salsa, pepper jack, a yummy chipotle mayo maybe. Mix all ingredients together, handling as little possible or the burger will be tough. You can’t totally mix the meats together so don’t bother trying. Shape into four to six burgers depending on what type of pigginess you are feeding. I made five good sized burgers. Cook by preferred method I grilled them) until no longer pink in the middle. You can’t cook these medium rare (my usual donenes…mmmmm, e-coli!) or medium because of the chorizo. Top as desired (I topped mine with a fried egg because that is one current trend I can soooo get behind) and enjoy the yumminess.